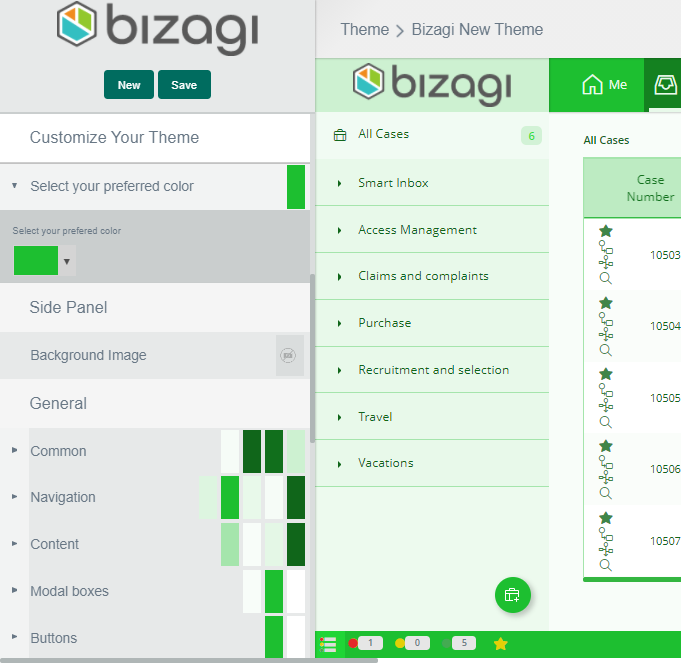 The Theme Builder offers further options to make your most demanding themes possible. You can define the configuration of colors for each singular Work Portal component. To customize specific components just select a base theme and change the properties of the different components as you desire. The following are the components that can be customized. These are found under the Customize your theme options. •Common: Areas that are always displayed. •Navigation: Search fields and links. •Common: Global containers and form's text. •Font family: Font type of Work Portal texts. •Text shadow: Shadows of titles, page numbers and options of the Work Portal. •Box shadow: Shadows of boxes in the Work Portal. •Border radius: Smoothing of boxes and fields borders. Text line spacing; it can be normal or minimum.